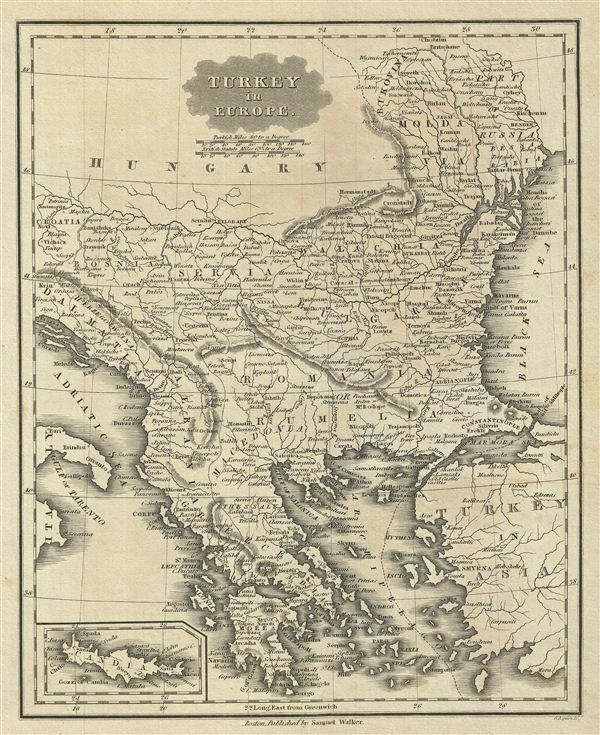 This is an attractive example of the 1828 Malte-Brun map of Turkey in europe. Representing the european lands claimed by the Ottoman empire in the early 19th century, the map covers the modern day nations of Greece, Macedonia, Albania, Croatia, Bosnia, Serbia, Bulgaria, Moldova. An inset map in the lower left quadrant details Candia. As this map was being drawn, the Greek people were in the midst of a bloody war for independence against their Ottoman Turkish overlords. With the help their european allies in Russia, United Kingdom, and France, the Greek revolutionaries finally threw off the Ottoman yolk in 1832. Various, important rivers, islands, cities and other topographical details are noted. This map was published by Samuel Walker in 1828 as part of the American edition of Conrad Malte-Brun's System of Geography, Vol. I. Very good. Blank on verso. Original platemark visible. Minor overall toning.